Sister parishes are very important to the developing parishes in Russia. Right now, a number of American parishes are serving as sister parishes to growing parishes throughout eastern Russia. The relationship benefits both parties. Parishes in Russia get the help they need to get started, to build a small church, or to initiate a charitable program. Meanwhile, the American parishes gain a greater understanding of the Church in Russia, and form a bond with the Catholics there. The information below will familiarize you with this program. 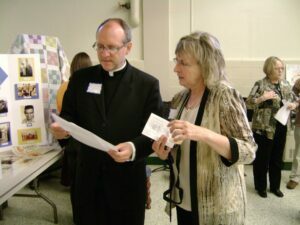 What Does a Sister Parish Do? First and foremost, members of the sister parish keep the Russian parishioners in their prayers. Russians are always surprised and pleased to learn that others were praying for them during their many years of persecution. They are still heartened to know that these prayers continue. Beyond that, sister parishes define their own level and type of assistance. 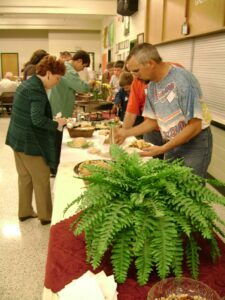 A sister parish might decide to have one large fundraiser each year. Or they might choose to hold quarterly raffles. Or the youth group or confirmation class might adopt a Russian parish to assist every year as their annual service project. Some parishes take a low-key approach and simply “adopt” the entire mission effort. Others choose to support specific programs, rather than parishes. They might include Mission Society donation envelopes in their monthly packets and distribute the Vladivostok Sunrise newsletter at their parish. Which Russian Parishes Need a Sister? Our Lady of the Pacific, Nakhodka. This is a small, but growing parish that has been housed in a cramped apartment for years. The parishioners are hoping to build their own church, but need several sister parishes to help. Visitation Parish, Lesozovodsk. Parishioners here are also hoping to build a church one day, as they have been attending Mass in a renovated barber shop since 2002. The poverty is extreme in Lesozovodsk, where all the major industries have closed, and the only remaining jobs are very low paying. Contributions from sister parishes could help tremendously with general parish support. Most Holy Mother of God, Vladivostok. Our main parish also needs help from sister parishes. This is where the many charitable, catechetical, and pro-life projects originate, so general operating support is always needed. How Do We Know What Our Sister Parish Needs? You can contact the mission office, read newsletters, and learn as much as you can from this website. Some Russian parishes need funds to build a new church, while others may have many single moms who need one-to-one assistance. Some parishes, because of the poverty, need funds just to pay for church supplies and utilities. How Long Does the Commitment Last? The commitment lasts as long as your parish wishes. Also, parishes can re-define the relationship at any time. 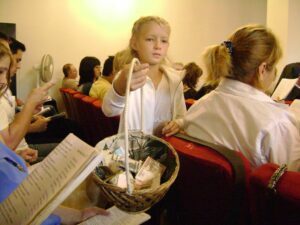 For example, they may choose to discontinue monthly envelopes and begin simply tithing a certain percentage of their income to their sister parish. Or they may choose to switch their support from a particular parish to the pro-life effort. Please know that the priests in Russia encourage parishioners there to contribute to the support of their own parish. Eventually, those parishes and their associated programs should become self-sustaining. The sister parish relationships should not foster long-term dependency. How Do We Keep Updated with Our Sister Parish or with the Program We Support? You can stay informed through the bi-monthly newsletters and periodic visits to our website. We also e-mail short news paragraphs to the sister parish contacts every month, so they can include them in their bulletins. In addition, we try to schedule Fr. Myron and Fr. Dan to visit the sister parishes every 1 – 2 years. And, as always, parishes can contact the mission office at any time with questions or to ask for specific updates. Can We Visit Our Parish in Russia? Yes! In fact mission teams often form with the intention of learning firsthand about their sister parish. Your parish might wish to send a carpentry team to build playground equipment in your sister parish’s village. Or you might send a group to help clean up an old building before it’s renovated for Church use. Or your church might send a team to help with the many charitable activities, to take pictures, to meet and get to know sister parishioners, and to report back to the parish. Learn as much as you can about the mission society and the tremendous work going on in eastern Russia. There’s plenty of information on this website, including past newsletters, some excellent interviews with the priests, and our mission DVD. Check our upcoming events. Perhaps one of the priests or one of our lay volunteers will be speaking in a community near you. Meet with your pastor to discuss the possibility of becoming a sister parish. If others are interested, ask them to join you. But don’t “gang up” on the pastor; he has many things to consider before agreeing to the sister parish relationship. If one of our priests or lay volunteers will be speaking in your area, invite your pastor to attend. Alternatively, check with the mission office first, then ask your pastor if that speaker could make a one-time presentation to one of the parish groups or to the parish as a whole. Contact the mission office. We can help you with fundraising ideas and with ways to stay in touch with your sister parish. Gather a group of people to serve as the sister parish committee and start planning your activities!